The city of Rakvere is situated in north Estonia and the administrative, economical and cultural centre of the Lääne-Viru County. According to the Estonian settlement system Rakvere is considered as one of the so called old county centres and with about 17.000 inhabitants the 7th largest City in Estonia. The city has joined the Covenant of Mayors as first city in Estonia and wants to become the leading city in energy saving in Estonia. Seminari Street was founded in 1920ies as a part of a general extension of the historic city. Today the street is bordered by houses originating from different times as well as different architectural styles and sizes. One can see wooden and stone houses from prewar era as well as typical apartment houses from Soviet time. Single-storied houses are rowed up with five-storied panel colossuses. The multi-apartment buildings bordering the street are the dominating structure in the area. The thermal conditions and the appearance of the apartment buildings do not correspond to contemporary needs or expectations and more and more attention is paid on the reconstruction of the façades of those buildings. The population has been quite stable in Rakvere over the last years, although there is a tendency to move from the areas with a high density – like the target area – to single-family house areas. 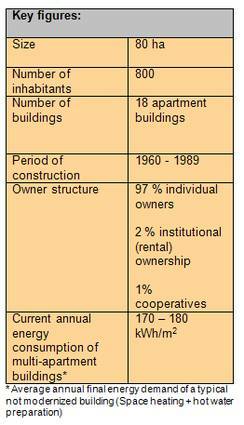 In order to encourage a more compact and energy efficient settlement structure, it is of public interest to enhance the living quality in the existing building stock and to improve the overall quality of urban environment in the target area. In compliance with the Master Plan and the Sustainable Energy Action Plan of Rakvere city government the overall upgrading of inner-city areas shall inhibit diffused urbanization and contribute hence to a sustainable settlement structure. Despite the poor condition of the buildings, residents are rather hesitating towards refurbishing activities. This is due to the fact that the majority of the residents have a very limited financial capacity and little access to information about support possibilities. Therefore, the major challenge of the project lays on the development of proposals for tailor-made solutions for the upgrading of the building stock by the owner associations. The goal of the project is energy saving, enhancing the more efficient use of the public space and connecting the central part of the city with the town’s green corridor. Also, more attention should be paid on the importance of shaping the living environment and development of good design examples for increased energy efficiency. In the target area a step-by-step approach is applied. 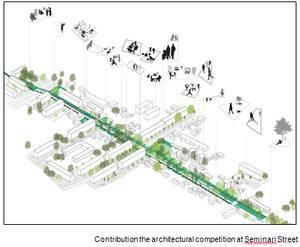 In the first stage, a public idea competition is carried out in order to get the best solution to develop Seminari Street to a linear park and to get ideas for the renovation of the façades of the houses surrounding the area. Both, architectural as well as landscape architectural aspects are combined in the idea competition. The City Government of Rakvere expects architectural solutions for renewing the façades of the typical Soviet-style apartment houses and landscape archi-tecttural solutions for re-designing Seminari Street in order to alter it to an attractive urban landscape and connecting corridor between the heart of the city and city forest in the south. The goal is to get an integral solution where both elements of the task are solved in a mutually complementing manner: forming a united and integral urban environment. The next step of the project is the preparation of specific renovation projects that are carried out on the basis of the attained idea solution in cooperation with the house owner associations of the area. Those building projects are the basis for future renovation works on apartment houses in order to make the houses energy efficient and adding to the more attractive urban environment. The intention of Rakvere’s City Government is, by investing in the compiling of the building project documentation, to inspire the different individual owners of the housing associations to take up the actual renovation works.